The Mayor’s Emergency Management Office of Philadelphia has just released the updated data with the numbers of the Puerto Rican population affected by Hurricane Maria that has arrived in the city and that has been assisted by the Disaster Assistance Service Center (DASC), in which several federal, state and local public entities participate, along with civic organizations such as the Salvation Army and the Unidos Pa 'PR campaign. According to the report, the DASC of Philadelphia has received - up to November 17 - 1,284 people and 586 families (584 from Puerto Rico and 2 from the Virgin Islands); being the week of November 13 the period with the greatest influx of victims in search of help. One of the characteristics of the victims of Hurricane Mary in Philadelphia is that they are people who came to the city by their own decision and without any state aid since Pennsylvania was not declared by FEMA as a state willing to receive the Puerto Rican exodus. Of the people served by the different organizations that make up the DASC, 507 registered as adults and 287 as children or adolescents, the majority under 12 years old. Almost all have the same urgency: work and a place to live in dignified conditions. One of the first cases attended by the DASC is that of Raúl Berríos and his son Asaf. Raúl is a 64-year-old man with a vast experience. He tells his life story, along with that of his 9-year-old son, before, during and after Hurricane Maria. Originally from the Obrero neighborhood (Santurce sector), in San Juan, this teacher, pensioner, cultural promoter and even "embelequero" -as one of his friends on the island called him-is above all a musician. The son of Luis Berríos, a professional musician who played in the orchestra of the legendary Arsenio "El Ciego Maravilloso" Rodríguez, he is today knocking on Philadelphia’s doors. Raúl and Asaf arrived at the beginning of October forced by the situation of the island, aggravated by the passage of Mary on September 20. Without school and access to health services, Asaf and Raúl had to leave their house in the care of a friend. 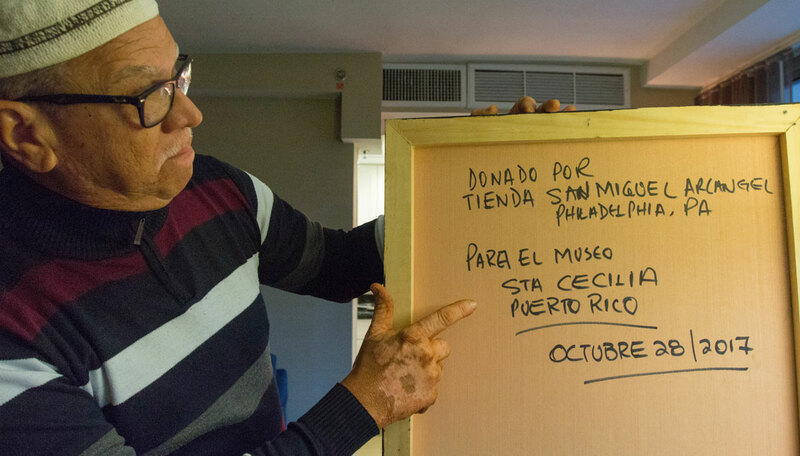 Raúl is a cancer survivor patient, however, he has to continue his treatment and with half of Puerto Rico in the dark and isolated, he was forced to leave. "To be able to work, I need to be in good health. I have to save this child, who is my traveling companion ", emphasizes Raúl in the hotel room where he temporarily lives with his son. Asaf is a charming child, full of energy like his dad. It's Raúl's corduroy and between the two they make a powerful musical duet. Armed with a rubber drum and some sticks, "we jammed and played", says Raúl. They have already done this several times, they do it whenever they can: to not lose the habit and the rhythm; to accompany and concentrate, but especially to clear the horizon. The house was not the only thing these two Puerto Ricans left on the island. Raúl is a musician, but also a cultural promoter with more than 40 years of experience and a working capacity of the Caribbean artists. In Puerto Rico, he led several projects, including the Santa Cecilia Museum (patron saint of musicians), a project with which, through the recreation of ancestral instruments, he rescued the connection between Africa and the Caribbean. There is also the Blind Jazz Project, a jazz band made up of blind musicians that Raúl has helped to create. The band is widely known on the island. And, as if that was not enough, there is EcoMusiclaje, a project with which he managed to kill two birds with one stone: to create awareness of the need to take care of the island's natural resources, and to continue promoting musical learning in childhood as part of the need to preserve Puerto Rican folkloric wealth. Today, Raúl’s urgency is not to lose the rhythm. In order to do this, he has to first stabilize his situation: get a job and a place to live. Everything he does he does for his son, Asaf, who after a complex process, managed to enroll in a school in South Philadelphia. "We are very positive because, with everything we left there, we have a beginning to do a lot of things and be able to get involved with the community here," he says. And as difficult as things are, Raúl doesn’t allow himself to lose strength. Optimism is a manifestation of joy, and joy is a fundamental part of their Caribbean character. "What we have seen (here in Philadelphia) is a good place to plant what we have been working on for many decades and this is the time for us," he says. Look forward to the development of this and other stories of the Puerto Rican exodus to Philadelphia in the wake of Hurricane Maria.